Raser Technologies' edge in geothermal power development could bring some big changes in power generation from heat recovery and lead to smaller power plants. Raser Technologies' new geothermal power plant near Beaver, Utah, is a potential model for a small power plant future in the U.S. It consists of 50 mini-power plants, each tied into the geothermal resource and capable of working independently. With alternative energy, sometimes it's as simple as getting energy from the earth. "What we are doing is literally farming heat from the earth," says Brent Cook, CEO of Raser Technologies Inc., talking about the revolutionary new closed loop, lower temperature, and modular approach the Utah-based company is taking to geothermal power development. What's particularly exciting is that this same power generation technology has the potential to be applied in any industrial setting where heat is a byproduct. "I predict that it will revolutionize the power industry," Cook says. "Now, instead of building mammoth power plants that are belching smoke, we are talking about many smaller plants." The company's new geothermal power plant near Beaver, Utah is a potential model for the future, consisting of 50 mini power plants, each tied into the geothermal resource and capable of working independently. This approach to power generation is simply an idea whose time has come, says Cook. "I think what you are seeing now is a drive and a push toward innovative, zero pollution-type power generation," he says. "The smaller power plants actually lend themselves better to that approach, and we think that technology has advanced dramatically, even in the last few years-in particular regarding heat recovery technologies." The 14-megawatt Beaver facility marks the first new geothermal power plant built in Utah in 20 years. Utah has substantial geothermal resources and is one of five western U.S. states where Raser has development plans. The Beaver facility is the company's first geothermal power plant. The 14-megawatt facility also marks the first new geothermal power plant built in Utah in 20 years. Utah has substantial geothermal resources and is one of five western U.S. states where Raser has development plans. The company is also engaged in developing geothermal projects on 100,000 acres in Indonesia, in partnership with Indonesia Power. Cook notes that their focus is predominantly domestic, however. "We have the largest geothermal portfolio of undeveloped projects of any company that we know of," he says. Cook believes that with the recent unveiling of this new modular, low temperature geothermal technology, Raser has put some distance between itself and its competitors in both the geothermal and green power industry. In terms of new project development, the company says it has accomplished in months what usually takes years, which gives it a further competitive edge and is the reason behind the company's aggressive expansion strategy. 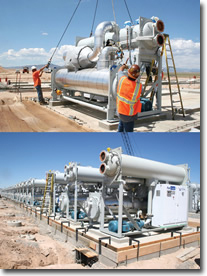 The company has also tapped into a highly productive geothermal resource in Utah. Though the paint is barely dry on Raser's Utah facility, it has begun supplying power to the city of Anaheim, California, and the company has plans to commission eight to ten new 14-megawatt geothermal plants per year, primarily in the western United States. Each new plant will cost in the neighborhood of $57 million. A positive aspect of the current economic downturn, Cook says, is that it has driven costs down, more drilling rigs are available, and the company is able to have its equipment built by manufacturers without any waiting period. The work Raser is doing is one of the bright spots in an otherwise bleak economy. Cook adds that although it is difficult to secure financing in today's market, Raser has worked hard to establish a financing program that he describes as creative and recession-proof. Using the company's proprietary modular power plant design, it was able to complete major construction of the Beaver geothermal power plant in six months, compared to the typical five-to-seven year time frame for bringing a geothermal power plant on line. 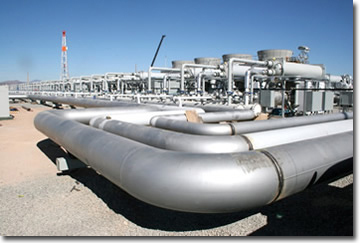 In addition to leading edge technology that allows Raser to commission new geothermal-based power production over a much shorter construction timeframe, the company has also discovered a new geothermal formation in Utah called the Thermo resource area. It has been called the largest geothermal discovery in the past 25 years and has the potential to produce about 238-megawatts of power. Given the size of the resource, and the nearly 50,000 acres the company can now access, the plan is to build aggressively at this site for at least the next decade. The Thermo area is also well-positioned geographically to transmission lines that supply the attractive Southern California market with green geothermal power. United States. Power generated at the Utah geothermal facility is sold at the same market price as power generated from combined cycle natural gas. What also gives Raser such a bright future is its partnership with UTC Power. It is a division of United Technologies Corp., and a sister company of Carrier Corp., a major producer of heating and air conditioning products. It has developed the modular PureCycle power generation unit, which comes equipped with a fluid called R-245fa. It is a benign, refrigerant-type material that converts from a liquid to gas at 57 degrees Fahrenheit versus about 220 degrees Fahrenheit, as is common in other geothermal systems using steam from water to generate power. Cook says even though its flashpoint is only 57 degrees, the steam generated from R-245fa is capable of driving the generator turbine and operates as efficiently as steam generated from water. Use of this fluid also expands the economic viability of many more low temperature geothermal resources, as well as industrial processes where excess heat is being generated. UTC Power has also provided Raser with a performance and uptime guarantee on its power plant equipment, which Cook says is very beneficial. equipment supply arrangement with UTC, and it's the combination of the UTC Power system and Raser technology that actually gives the company its advantage. He says it would be very challenging for a competitor to reproduce Raser's total geothermal power package. Production at the Utah power plant begins with the acquisition of hot water from wells bored into the geothermal resource. The water travels along pipes into a heat exchanger that has the appearance of a giant radiator. The water flows under pressure-to keep it in a liquid state-through tubes on the heat exchanger and is then re-introduced into the formation at a point where it reheats and eventually recirculates through the system. Since the entire system at the Utah facility is closed loop, depletion of water from the geothermal resource is not an issue, as was the case decades ago in other geothermal-rich areas. In the heat exchanger, a separate set of tubes contains the R-245fa fluid. Heat is transferred from the formation water to the R-245fa fluid, which flashes into steam and drives a power turbine before flowing through a condenser, where it is cooled and converted back to a liquid state. Eventually, it too recirculates through the heat exchanger. Because the entire system is a closed loop, depletion of water from the geothermal resource is not an issue as was the case decades ago in other geothermal-rich areas. In some of these areas, super-heated steam was simply allowed to vent into the atmosphere, eventually depleting the water resource in the formation. Raser does not face the water depletion issue in Utah. "When a well field is properly managed, meaning your re-injection points are far enough away from your production wells, you should see no degradation in heat or fluid loss," says Cook. The geothermal and heat recovery technology being commercialized by Raser Technologies has captured the attention of some political heavyweights in Washington. "Raser Technologies is a company that has consistently pushed the envelope to develop, and bring to market, some of our nation's most advanced concepts in clean energy," says Orrin Hatch, Republican Senator for Utah. "Geothermal is clean and green, and it's abundant, especially for Utah. Unlike wind and solar, geothermal energy provides us with a renewable source of base power. "If we are interested in reducing carbon emissions on a significant basis, we must increase our green sources of base power. Today, Raser Technologies is at the front of doing just exactly that." In other words, power generated from a geothermal resource is a good substitute for power generated from non-renewable sources like natural gas and coal. Unlike solar and wind, it is available 365 days a year, day or night, regardless of the weather. The Obama administration's support of alternative energy development is having a positive impact on the industry, says Cook, with changes such as allowing developers to achieve a tax credit right up front versus having to spread it over 10 years. He believes that government-backed, guaranteed loans for renewable energy projects will also be beneficial and should start to have an impact by the end of 2009.